April 9, 2019 Monster Hunter World’s Witcher event finally hits PC in May. 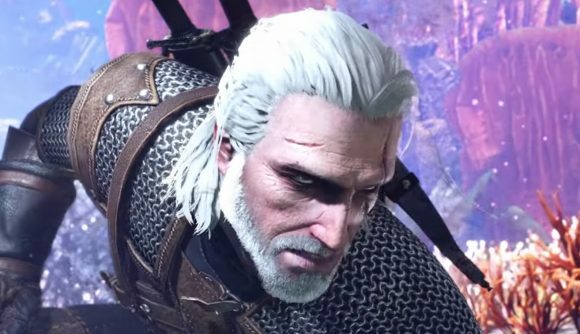 Console players have been enjoying Geralt’s debut in Monster Hunter World since February, and now there’s finally a PC release date for the Witcher crossover. The special event will finally land for the Steam version of the game on May 9 at midnight GMT – that’ll be 1:00 BST, or May 8 at 20:00 EST / 17:00 PST. Between this and Assassin’s Creed, there’s no apparent limit to Monster Hunter’s crossover potential. You may have already seen the details with the console release, but here are the basics. You’ll have a new special assignment when the update goes live which will allow you to play as Geralt on an RPG-influenced quest with side objectives leading to multiple endings. You’ll be able to pick up materials to craft Geralt’s armour and the traditional Witcher’s silver sword. While that quest will be a permanent addition to the game, another limited time quest will be available from May 17 until May 30. This Woodland Spirit contract will be a great deal more difficult, but it’ll give you materials for a Ciri armour set and a dual blade weapon based on her Zireael sword. Your primary new target in all this is the Leshen, a spriggan-style beast from The Witcher which has control over nearby plants and animals. The trailer above will give you a better look at what to expect, or you can get more details in the official announcement. While Monster Hunter World PC has gotten a few events in parity with the console releases, it seems we’re still going to have to wait for a lot of the big stuff.